This dramatic film is based on the true story of Dr. Samuel A. Mudd, the Maryland physician who was arrested and convicted in 1865 for conspiracy in the assassination of President Abraham Lincoln after innocently treating the broken leg of John Wilkes Booth in the mid dle of the night. 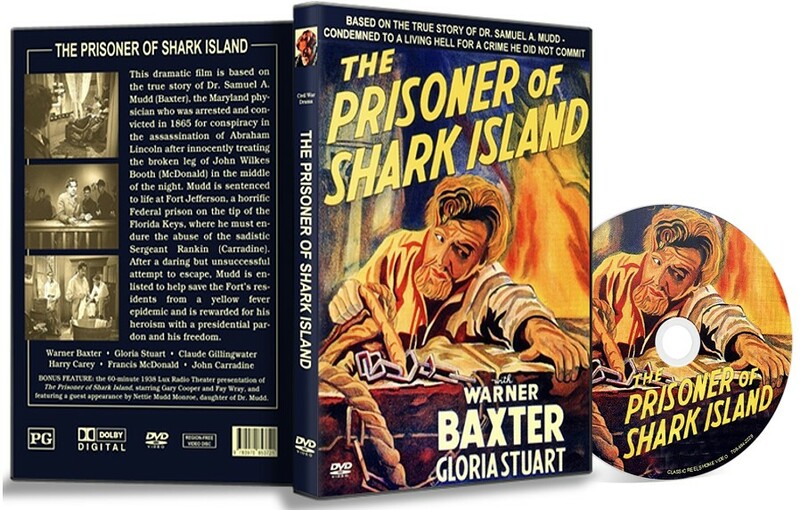 Mudd (Warner Baxter) is sentenced to life at Fort Jefferson, a horrific Federal prison on the tip of the Florida Keys also known as "America's Devil Island," where he must endure the abuse of the sadistic Sergeant Rankin (John Carradine). After a daring but unsuccessful attempt to escape, Mudd is enlisted to help save the ‘Fort's residents from a yellow fever epidemic and is rewarded for his heroism with a presidential pardon and his freedom. Also starring Frank McGlynn as Abraham Lincoln, Gloria Stuart as Peggy Mudd, Francis McDonald as John Wilkes Booth, and Douglas Wood as General Thomas Ewing. BONUS FEATURE: the 60-minute 1938 Lux Radio Theater presentation of The Prisoner of Shark Island, starring Gary Cooper and Fay Wray, and featuring a guest appearance by Nettie Mudd Monroe, daughter of Dr. Mudd.